Please read the following carefully. Signing this contract indicates your agreement to the terms herein. All sales are final. There are NO returns, exchanges, refunds, or transferred credits on any item sold at d’Anelli Bridal. Additional cancellation fees may be incurred per manufacturer guidelines, payable by purchaser. Before the order has been placed with the manufacturer, please review the order to ensure that the style, size and color are correct. Garment size is recommended based on the manufacturer’s size chart and the measurements taken at d’Anelli Bridal. d’Anelli Bridal is NOT responsible for measurements not taken by anyone other than a d’Anelli Consultant. You are encouraged to take an active part in the sizing process. If you feel uncomfortable with the measurements taken, inform d’Anelli Bridal immediately, before signing this contract, and you will be re-measured. Special order garments are not custom made. Measurements are taken to ensure the best fit possible; however, alterations are almost always necessary to ensure formal special occasion fit. d’Anelli Bridal is NOT responsible for any additional costs incurring for proper fit, including, but not limited to, alterations or additional materials, due to weight loss, weight gain, pregnancy or plastic surgery. This garment is a special order and requires four to seven months for production. All ship dates are approximate. The manufacturer reserves the right to change a ship date based on their production schedule. Once the order has been placed with the manufacturer, the order cannot be expedited or rushed. Merchandise that requires shipping from d’Anelli Bridal to a different location will be shipped insured with a signature confirmation required. Orders must be paid in full before being shipped from d’Anelli Bridal. Manufacturer dye lots may vary. d’Anelli Bridal, is NOT responsible for differences in manufacturer dye lots. The named contact person, as specified on the original order, will be notified of the arrival of the merchandise. Garments must be inspected by bride or named contact for any manufacturer flaws or discrepancies within 7 business days after arriving at d’Anelli. Inspections are by appointment only. It is the responsibility of the named contact to notify all necessary parties (bridesmaids) of the arrival of the merchandise to ensure timely inspections. Any remaining balance on special ordered merchandise is to be paid in full at the time of inspection. d’Anelli Bridal will NOT release any merchandise to anyone other than the named contact without prior authorization and proper identification. If the named contact is unable to pick up the merchandise, the name of an alternate authorized pickup person must be provided to d’Anelli Bridal. If the event date stated in the original order changes for any reason, it is the responsibility named contact person to notify d’Anelli Bridal. All merchandise must be picked up no later than seven daysafter the event date on file. Any merchandise not picked up is considered abandoned and will become property of d’Anelli Bridal. d’Anelli Bridal is NOT responsible for contacting individuals in regards to any merchandise left behind. Merchandise must be inspected before leaving the store. After the merchandise is removed from d’Anelli Bridal, d’Anelli Bridal is no longer responsible for the care or condition of the item. Pressing is discounted when alterations are completed by a d’Anelli Bridal seamstress. 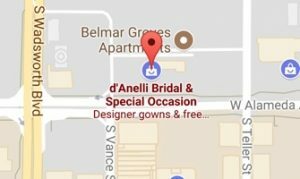 Gowns altered by d’Anelli bridal may be pressed additional times for a fee; $165 for wedding gowns, $45 and up for special occasion gowns. Pressing for gowns not altered by d’Anelli bridal is available for a charge of $165 for wedding gowns, $45 and up for special occasion gowns. Pressing for veils, slips, and other accessories is available for an additional fee. Merchandise to be pressed must be in the store no later than ten days prior pick up date. Dry cleaning before or after the event is available for an additional fee; $225 for wedding gowns, $50 and up for special occasion gowns. d’Anelli Bridal does not recommend dry cleaning for special order garments, as they are a brand new product. Gown preservation is available after the event for an additional fee.